Once in a while you might need to activate the maintenance mode of your application due to updates, adding new products, changing the template of the application and many other actions requiring your Store to be temporary disables. 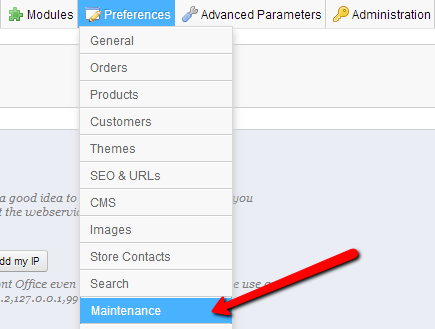 In this tutorial we will show how exactly the maintenance mode of your Store can be activate. In order to activate the Maintenance mode you will need to first login into your Store’s admin backend. Once logged you will need to access Preferences > Maintenance. Once the Maintenance page is accessed you will be presented with two options you will need to set before the maintenance mode is activated. Enable Shop – The actual value if the shop should be disabled and put in maintenance mode or enabled and no maintenance mode activated. By default this value is set to yes so the shop can be open for your customers. Maintenance IP – Your local IP address which can be easily detected by the application if you simply press the “Add my IP” button. Of course you can add multiple IP addresses separated by coma if for example you would like certain people to be able to access you store while in maintenance mode. As soon as you are done with the settings you should simply press the Save Button and the configuration will be saved. Note that the maintenance mode will not affect the functions of your Store’s admin backend. This basically mean that you will still be able to perform changes on the Store’s admin backend while the maintenance mode is active which is the main idea behind this feature.